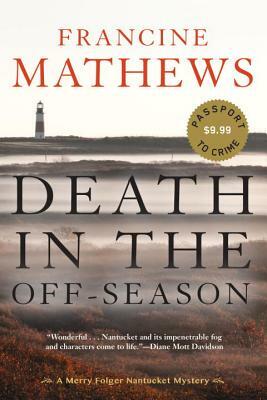 When Rusty Mason, scion of one of Nantucket's oldest and wealthiest families, is found dead in a flooded cranberry bog one foggy fall night, thirty-two-year-old detective Merry Folger is faced with her first murder case. Merry is the daughter of the local police chief and granddaughter of his predecessor; her father is a strict boss and Merry feels pressure to go the extra mile to prove her promotion to detective isn’t just nepotism. But the Mason murder is a demanding first test. Merry’s investigation brings to light all the tensions that plague the tiny community of Nantucket: the decades-old grudges, the skyrocketing real estate that only wealthy weekenders can afford, the resentments of the old Nantucket families who are barely keeping their homes and heritage fishing businesses alive. But Merry knows the island and its politics in a way only a local can. Francine Mathews was born in Binghamton, New York, the last of six girls. She attended Princeton and Stanford Universities, where she studied history, before going on to work as an intelligence analyst at the CIA. She wrote her first book in 1992 and left the Agency a year later. Since then, she has written twenty-five books, including four other novels in the Merry Folger series (Death in Rough Water, Death in a Mood Indigo, Death in a Cold Hard Light, and Death on Nantucket) as well as the nationally bestselling Being a Jane Austen mystery series, which she writes under the penname Stephanie Barron. She lives and works in Denver, Colorado. "Death in the Off-Season is a wonderful find . . . Detective Merry Folger comes across as a real person, albeit a smart one, with doubts and concerns." "Spunky but inexperienced, third-generation Nantucket cop Meredith Folger investigates murder in this spare, atmospheric debut."